This 9-day sea kayaking trip is more suitable for individuals who do have some experience in sea kayaking. A few day trips or some multiday trips and some introductory training courses on sea kayaking would be enough. Some camping experience is also welcome! During this sea kayaking trip we either wild camp or stay at beautiful apartments, according to our planning (5 nights wild camping / 4 nights’ accommodation). When wild camping is the case, we cook for our dinner and when accommodation is arranged, we enjoy Greek cuisine among the plethora of the local tavernas we find at each place we visit! We meet at the apartments in Skiathos town (Chora) where our first night’s accommodation is arranged (details are sent following your booking confirmation).We set our meeting for early evening in order to have time to get to know each other within the group and discuss, prepare, plan and brief for our sea kayaking trip the following days! In our first sea kayaking day we launch near Skiathos town (Chora) and head south following the island’s coastline or hopping to the south west of Tsougria isle. The south coast of the island is a green landscape full of pine trees with numerous beautiful sandy beaches and amazing waters. 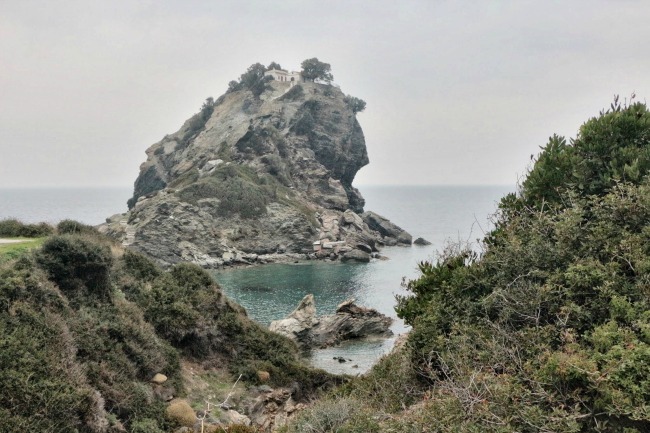 After we enjoy our lunch and swimming at one of the stunning beaches we find on this part of Greece, we head north and wild camp at Aselinos beach for the night. On our way from Aselinos to Lalaria, we are in for a drastic change of the coastline. Big sandy beaches give place to more dramatic scenery with caves, cliffs and the remaining of Skiathos’ Medieval Castle – we will be exploring one of the most beautiful places in Greece! Lalaria beach is our stop for lunch and relaxation, bringing to our sea kayaking adventure the true meaning of holidays in Greece. Later on, we continue our way southeast and finally south to close our sea kayaking day on Arkos isle, wild camping. This is the first of the two long days of this journey. We launch heading east to Skopelos island today. This approximately 4 nautical miles crossing can become even more interesting if a school of dolphins choose to play around our kayaks. The beautiful beach of Armenopetra is on our way, providing a great opportunity for swimming and lunch. Leaving Armenopetra we paddle on beautiful water with the pine trees almost touching the sea and later along a rocky coastline to Panormos and Limnonari. Wild camping at Limnonari overnight. On the 4th day of our sea kayaking adventure, we launch from Limnonari and we paddle east following Skopelos’ beautiful south coastline to find Stafilos. This part of our sea kayaking trip will offer us a great deal of thrill: today we cross to visit Alonissos island and we head to the picturesque village of Votsi, where we opt for accommodation in beautiful apartments for our next two overnights! Cooking is great, still we have checked that local tavernas will do an excellent job as well… Enjoy Greek gastronomy, by trying some delicious local food tonight! We “travel light” for this day! All camping and extra gear can stay back as we head north along the east coastline of Alonissos to find another picturesque bay, Steni Vala. This stunning, full of surprises part of Greece’s coastline is rewarding. We enjoy swimming on the way and lunch at Steni Vala. Later, we head south to Votsi bay for the overnight. We leave the scenic Votsi bay in the morning and with our kayaks topped up for the next days we head to Skopelos town. We paddle, exploring bits of the coastline that we missed crossing to Alonissos two days ago and we enjoy our swimming and relaxing breaks on the way. We visit Skopelos town (Chora), while having the option to enjoy food from the local tavernas once more! 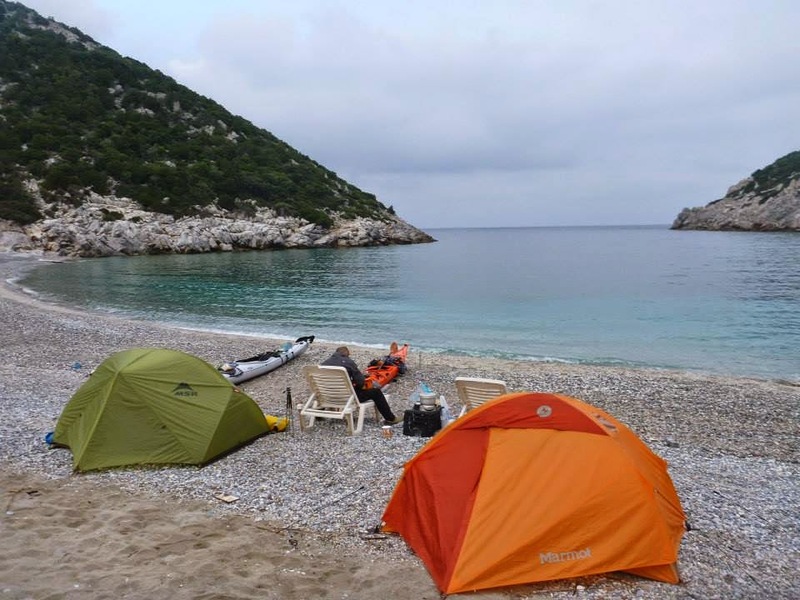 We continue our sea kayaking route until Glisteri beach, where we wild camp overnight. Today, our sea kayaking adventure takes us to the north coast of the island. The famous “Mama mia” church is on our way and the coastline is wild, rocky and secluded yet full of surprises! We paddle around the north part of the island and we point south following the coast to Armenopetra beach. Wild camping at Armenopetra overnight. We pack and launch in the morning crossing back to Skiathos island. On our way, we explore with our sea kayaks the Tsougria islet and its beautiful beach. We finish our sea kayaking adventure near Skiathos town, where after arranging our gear and settling in our apartments, we may enjoy Greece’s rich gastronomy at the local tavernas for one more time! This is a self catered trip and we can provide the cooking equipment (stove, pots etc). Pine trees touching the seaside, an alternating coastline with sandy, pebble beaches, steep slopes and dramatic cliffs along with some amazing caves, beautiful rock gardens, crystal clear water and quiet coves, the picturesque “Mama mia” church, Votsi and Steni Valla bays, as well as the area’s marine wildlife with plenty of playful dolphins are just few of the reasons that motivate us to share this experience in Sporades with you. Enjoy the outstanding beauty of Greece and discover the true meaning of holidays!